Adobe Photoshop Express is a free app for Adobe Photoshop that is developed by Adobe to be used on your Windows 8 and 8.1 computer without paying for it. The Adobe Photoshop Express app has no trial or an expiry date on it. When the Adobe Photoshop Express opens, it shows you a walk through about what features it has; after that you can add image to it by opening from your computer, Adobe Revel or capturing from Camera. It helps in editing the photographs easily with the tools that come in it. The app is not at all complex and hardly has any menus or options, if you compare it with the Adobe Photoshop software then Adobe Photoshop Express has only important photo editing tools in it. 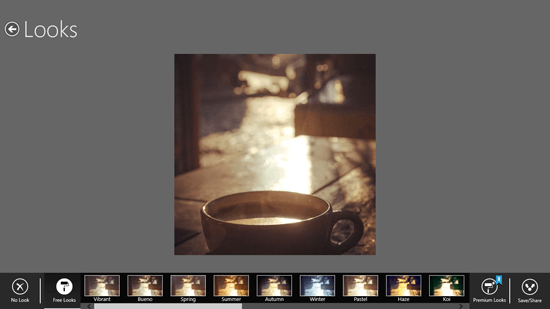 The menu or options for editing can be toggled by right clicking on the Adobe Photoshop Express app. You can see the menu options on the menu dock namely crop, correct, looks, red eye, reduce noise, auto fix, view original and save and share. With Adobe Photoshop Express app you can fix photographs automatically with the Auto-Fix option. It will adjust the exposure, contrast, brightness and white balance and give you an automatically adjusted photo. There are 22 filters in the section of Looks that can be applied on the photograph if you want to apply some interesting filter on it. The Looks include filters such as spring, koi, haze, vibrant, summer, pastel, winter, bueno, superpunch, vivid, glow, contrastpunch, black and white, silvered, carmine, memory, invert and more. With the help of this app, you will be able to adjust exposure, white balance, brightness, contrast, clarity, vibrance, etc. To view the difference between the original picture and in the edited image then you can click on the view difference button from the menu. You can save the edited photograph to your device, share on Facebook or upload it to Revel.